I go to a lot of events. Like, a lot. It’s part of my role at The Republic of Quality. Meeting people, learning, and sharing what I know (mostly about zombies). I love watching ideas transform into something bigger and better once they’re part of a collective. It’s a big part of why I co-founded The Design & Content Conference. I wanted a space for us to come together and make the web our world better and brighter through the sharing of ideas. It’s the open source way I fell in love with so many years ago. Everyone could use more soul-feeding events in their lives. To be be a friend and colleague without the pressure of the hustle. Friendship and safe spaces make us better humans. Instead of networking, I showed up for breakfast prep, washed dishes, and built campfires. I got real about fear and quality of life. I shared meals with friends. Friends who understood (and bested) my lame design and content jokes. I cross-stitched, met some local bison, and wrestled for a turn with wifi from the dark ages. I poured cola into my glass of wine and fell in love with a new drink (no judging allowed). I didn’t lead any sessions. Instead, I listened. I helped cover walls in post-it notes and shared ideas. I was guided through activities and discussions by smart friends. I looked for takeaways from each session, listening for key phrases that connected to my head and my heart. I created a set of posters based on these phrases. They sum up my journey from that November week and remind me that I’m not alone. I’d like to share these posters with you. They might mean something different to you, but maybe their message will help your work and the heart you give it. Download them, share them, print them, display them. Be reminded of your worth. They are currently in both 11 x 17 and 8 x 10 format. 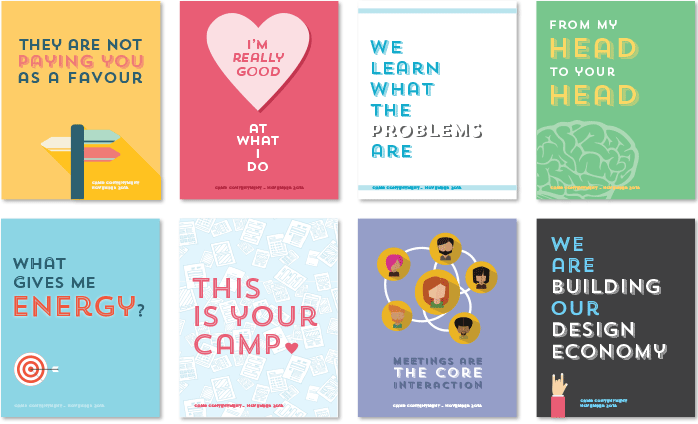 Download the full ZIP of Camp Contentment posters (3MB PDF). If you’re interested in putting on your own camp, you definitely should. Eileen Webb very generously created a great Github site with a recipe for the first Camp in 2013. I highly recommend finding your own camp contentment. I’m thankful I found mine.